/Stomping Grounds/ fig. The place where one was raised or where one has spent a lot of time. 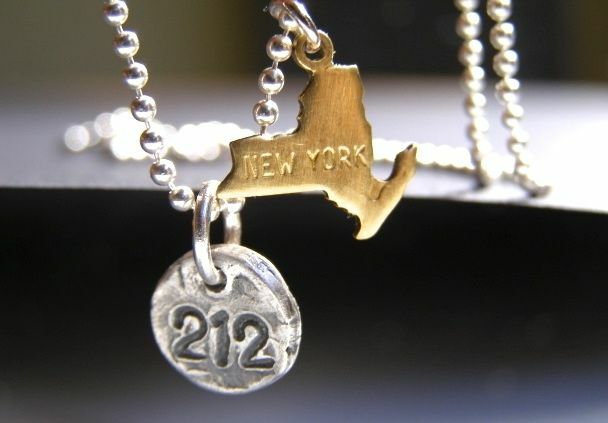 This necklace is a tribute to your stomping grounds whether current or your old stomping grounds. Manhattan, NY is one of my old stomping grounds. You will receive a handmade artisan fine silver charm with the area code of your stomping grounds and a brass charm of your state on a genuine sterling silver ball chain. All 50 states are available. Also available with a genuine 14kt gold-filled ball chain necklace.